We are so excited at Isabel O'Neil Bridal Collection about our upcoming trunk shows with our favorite designers and all of the new brides that we get to meet and help "say YES to the dress"! If you are newly engaged, you may be wondering what a trunk show is. A bridal trunk show is a special event where wedding gown designers present their newest collections for a limited time at a bridal boutique. Most bridal shops only carry select bridal gowns from each designer year round, which makes a trunk show an excellent opportunity for a bride to see all of the most current collection from that designer. You also typically get the opportunity to preview and purchase gowns that may not yet be available in stores. On occasion, a representative from the designer will be available at the trunk shows to answer questions about custom changes, and offer special pricing and incentives on gown orders placed during the trunk show. February 21 - 22, 2014: We get to kick-off our amazing schedule of trunk shows with the Fall 2014 collection from Alyne by Rita Vinieris. Rita Vinieris, the Creative Director of the established and sought after Rivini, presents a whole new style experience, Alyne; a bridal collection that celebrates simple luxury and pure design while making gorgeous gowns more accessible. Sophisticated ease, effortless glamour and simple silhouettes in rich fabrics are energized by refreshing design details for a strong fashion statement. This collection is easily described as fresh, beautiful and timeless with the essence of simple luxury. February 28 - March 1, 2014: We will have the Jenny Yoo Collection Trunk Show including bridal and bridesmaid dresses. Jenny Yoo designs for the discriminating bride and bridesmaid presenting a variety of dresses, incorporating rich and luxurious silks, chiffons, and cottons to create a feminine, and refined look. Attention to detail, cut, proportion, and workmanship ensures each dress the most feminine and flattering fit. 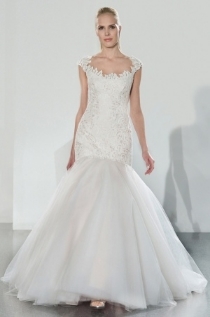 March 14 - 15, 2014: The much anticipated trunk show for Legends by Romona Keveza will be here! Known for her acclaimed Couture Bridal Collection which she founded in 1999, Keveza launched Legends by Romona Keveza in 2006. Legends by Romona Keveza was inspired by legendary fashion icons such as Grace Kelly, Jacqueline Kennedy Onassis and Audrey Hepburn and is designed with the traditional yet elegant bride in mind. Renowned for her creativity and innovation, her design signature puts the emphasis on femininity, sophisticated detail and luxurious fabrications. We will be offering 10% off of all new gown orders during these trunk shows and there is a possibility for additional incentives to be offered during the events. Don't wait to schedule your appointment to see the beautiful wedding dresses by your favorite designer as they are limited and we will fill up quickly for these exclusive events!